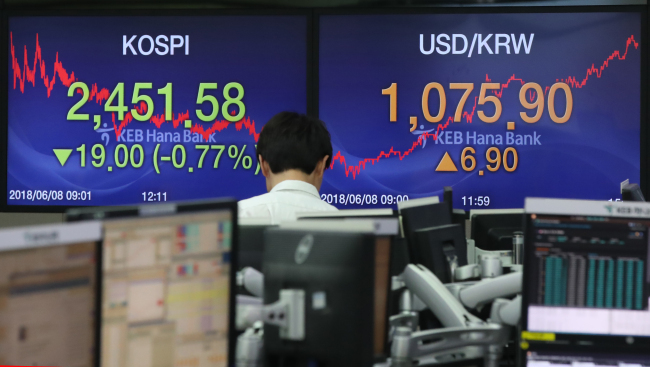 South Korean stocks closed lower Friday to end a five-day winning streak as investors tried to lock in profits from recent gains, amid lingering trade concerns ahead of a Group of Seven meeting, analysts said. The Korean won weakened against the US dollar. The benchmark Korea Composite Stock Price Index sank 19 points, or 0.77 percent, to close at 2,451.58. Trade volume was relatively heavy at 510.91 million shares worth 7.19 trillion won ($6.69 billion), with losers outnumbering winners 553 to 265. Investors took to the sidelines ahead of the G-7 summit that continues into the weekend, in which trade tensions between the United States and its major partners are expected to take center stage in talks. Foreigners and institutions sold a net 33.24 billion won and 498.6 billion won worth of stocks, respectively, while retail investors scooped up a net 503.8 billion won worth of shares. Tech shares dropped as China’s antitrust probe into major chipmakers sparked concerns over their business prospects in the world’s largest semiconductor market. Market bellwether Samsung Electronics declined 1.88 percent to 49,650 won, and SK hynix, the nation’s second-largest chipmaker, dipped 2.75 percent to 88,400 won. Steel shares slipped following a strong rally in the previous session. Industry leader Posco shed 2.17 percent to 360,000 won, and its smaller rival Hyundai Steel tumbled 6.17 percent to 60,800 won. In contrast, telecommunications rose after the nation’s three mobile carriers passed the preliminary test for the first auction for high-end fifth-generation network frequencies. No. 1 mobile carrier SK Telecom gained 1.55 percent to 230,000 won and its rival KT edged up 0.72 percent to 27,850 won. LG Uplus jumped 6.43 percent to 13,250 won.